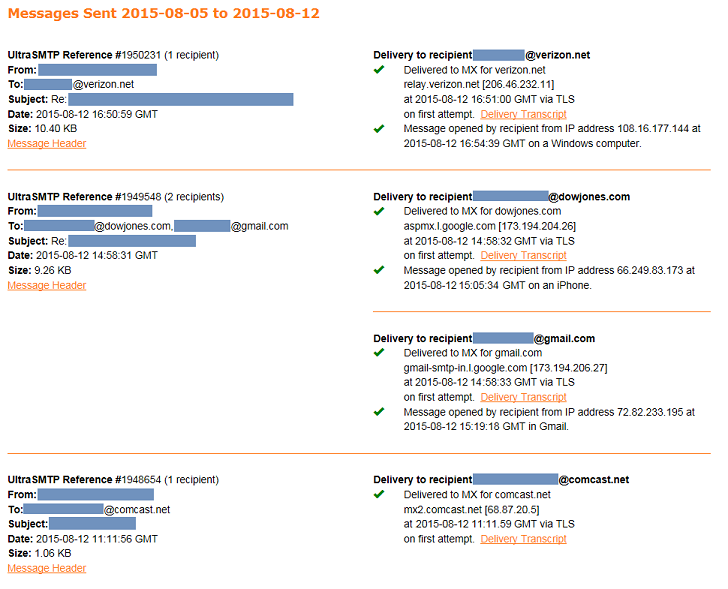 UltraSMTP provides you with access to real-time delivery status reports of sent messages. These status reports can be used to determine whether your recipient's mail server has accepted delivery of a sent message, or if message delivery has been deferred, or delivery has failed. Whereas most mail servers make this type of detailed delivery information available only to system administrators, a unique benefit of UltraSMTP is that it makes this information available to end users. For each delivery attempt, status reports include full delivery transcripts, which contain receipt acknowledgements from the recipient's mail server in the case of a successful delivery - similar to a transmission report after sending a fax. These transcripts can be used to show that a sent message was in fact received by the recipient's mail server. If a recipient reports to have not received a message, the delivery transcript from UltraSMTP can be useful to the recipient's mail service provider in tracking down the missing message and ensuring that future messages are delivered properly. Tip: You may want to opt to receive delivery status notices from UltraSMTP, but setup a rule in your mail system to have these notices routed to a separate folder specifically for these messages. This way, you'll have these notices on hand, without being inundated with them as they come in.